Need a small guitar to practice with while traveling, at school, at work or just at home? 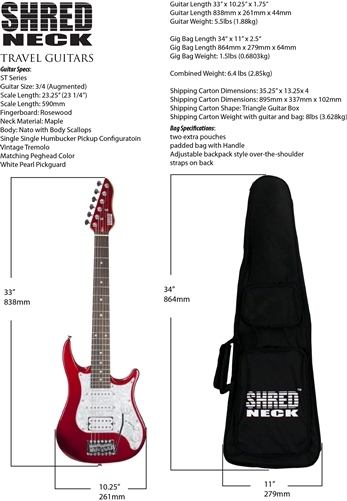 The Shredneck Travel Guitar is for you! Hit the road with this cool new 3/4 scale guitar! The Shredneck Travel Guitar - Model STVX-BK - Black Finish with matching color peghead is a 3/4 scale guitar featuring a modified ST body shape with body scallops on the treble and bass body horns. 22 Frets on a Rosewood dot fingerboard with matching color peghead. The bridge is a traditional style tremolo with a SSH (single, single, humbucker) pickup configuration. Features a master Volume and Tone control and 5 way selector switch. Gig bag Included. Gig bag holds guitar and has an extra pouch for carrying accessories items. The bag also includes a space for a Shredneck Practice Tool (not included).